Book: Kite Day by Will Hillenbrand. This is a cute, colorful story about friends Bear and Mole who build and fly a kite on a perfect, windy kite day. When a storm pops up, they lose the kite, but luckily it lands in a great place - in a tree, protecting a nest of baby birds from the rain. The text is very simple with lots of repeated sounds. We talked about what kind of weather you need to fly a kite (windy!) and that weather can change very quickly, especially in spring! Felt Story: Hello Sun! by Dayle Ann Dodds. Speaking of weather changing very quickly - in this cute picture book, every time we try to leave the house, the weather has changed and we need to change our clothes! Miss T had made this into a felt story and it was perfect to relate to our changeable weather. 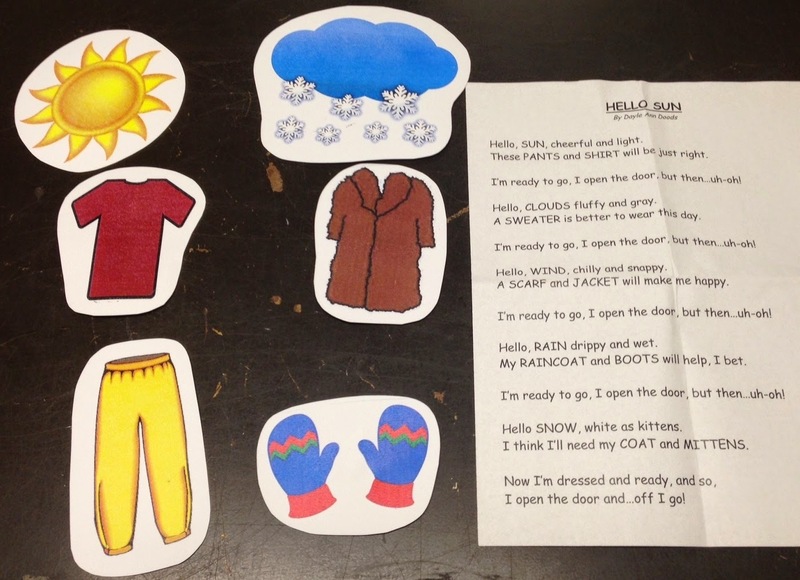 We talked about what different clothing you need when it's sunny, cloudy, rainy, snowy, etc. Book: Storm Song by Nancy Viau. 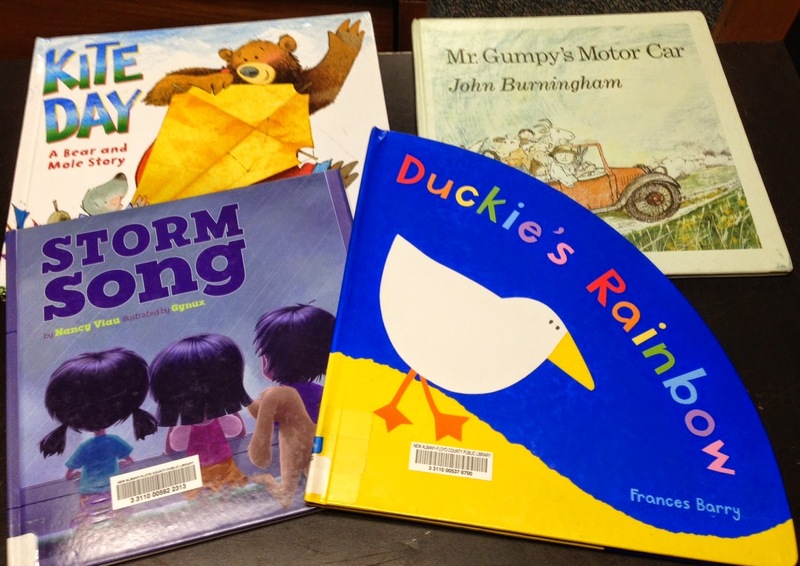 We'd especially had some stormy weather the week I went to visit the kids, so this book was perfect. Short, rhyming text evokes the sounds and sights of a thunderstorm rolling in - the roaring thunder, the spark of lightning, leaves blowing past the windows. When the power goes out, mom calms the kids by singing songs, making a snack, and taking a nap. Scarf Activity: Retell Duckie's Rainbow with scarves. I passed out the scarves and asked the children to notice what color scarf they had. When I reached the page with their color, I asked them to hold their scarves up high and wave them. When we get to the end, we all waved our scarves together to make a rainbow! Scarf Song: Toss Your Scarves. It's so much fun to play with scarves! This song is not only fun, but it gives the children practice following instructions and it builds gross motor skills. Toss them way up high. Twirl them ‘round and ‘round. Then let them, all fall down. Book: Mr. Gumpy's Motor Car by John Burningham. All of the children and animals want to accompany Mr. Gumpy on his motorcar ride, but when it starts to rain and the car gets stuck in the mud, no one wants to help push! This is a silly story and the kids just love the name Mr. Gumpy.